The same way in which adults become addicted to slot machines, children are finding video games addictive. The reward schedule of a video game is the same as gambling, you’re not sure when you’ll be rewarded, but you know that if you keep playing eventually you may win. The lack of a timeframe leads to skewed perceptions of time and eventually addiction. Digital addiction is detrimental to adults but especially to children, as it molds the way they eventually interact with society. Mental health issues, violence, and stunted social ability are all symptoms of the addictive digital world. Dr. Kardaras spoke on theHeath and Wellness Show podcast aboutthe effects of video games on young children. He speaks on the subject of compulsive video gamers. The reason it’s easy for children to develop obsessive and addictive behaviors is they don’t yet possess the ability or mechanism to moderate their usage. 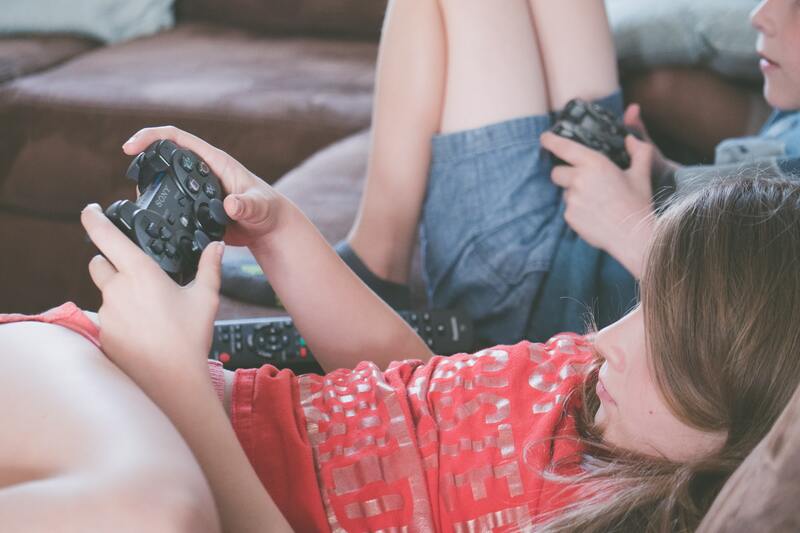 A huge danger is the phenomenon of video game psychosis, in which children are not realizing whether or not they are existing inside of the game and their online worlds begin to blur into reality. In a case studied by Dr. Kardaras, a child was put on antipsychotics as well as being hospitalized for a month because he could no longer differentiate between his waking life and his online existence. The child had no family history of mental illness, yet his symptoms were akin to the derealization that is common among hallucinogenic drug trips. An alternative study focused on five youths experiencing paranoia, anxiety, and hallucinations. None were abusing drugs or had a history of mental illnesses. It was found that whenthey disconnected or cut down on screen time the symptoms of psychosis began to subside. So the question is, why and how, is technology creating such extreme effects on young people and children? Shockingly it’s actually designed to do exactly that. The dopamine neurotransmitters that are associated with drug use and sexual experiences have been studied in the bodies of young people playing video games. The results showed that sexual experiences and video games alike raise dopamine levels to 100%. Dr. Kardaras uses the term, “digital orgasms” found to be occurring in the brains of children. Because the frontal cortex of the brain is not developed the lack of impulse control hinders children from knowing when to stop. Another reason for the dependency is the fantastical archetypes that are presented in video games. In an age where children are no longer as quick to believe in the tooth fairy or Santa Claus (as trivial as that may sound), they search for fantasies through the games, creating an illusion of another world where anything is possible. Adolescent data testers test games in order for video game companies to assure that kids are properly hooked. This is monitored through checking blood pressure, excitability, and adrenaline. Video game testers want a blood pressure spike of 180 during the game. If it doesn’t reach this level they make changes so it will. This hyperactivity caused by the hyperstimulation of video games is directly linked to the spike in prescribing Ritalin and Adderall. When children are being hyper-stimulated for hours their attention spans are made shorter, especially in moments that require special attention, like class. A USC study exhibited how digitaldetoxing has reduced the symptoms of ADHD. Beyond the deeper issue of mental illness and drug dependency, spending time online also creates a learning curve in children and their human interaction. This includes initiating face to face communication, holding up a conversation and picking up on social cues. In-person encounters become more difficult if you’ve been raised interacting through a screen. Technology has been incorporated into the military to create a divide between a soldier and their enemy, video-game-like technology puts a screen between the soldier and the victims. The fact that we know the safety of a screen dulls our ability to recognize when we’re really hurting people directly translates to the issues screens are having on younger children. Students today are 40% less empathetic that students 30 years agoand narcissism has increased by 58%. If a social interaction is ultimately achieved gaming and digitaltrends have put a huge damper on reaching a deep meaningful conversation. If the conversation doesn’t span farther than what game you were playing online the potential for human connection is stunted at a young age. The importance of human interaction on your mental health is greater than you may think. In a study of 7,000 men and women, it was found that people who were “disconnected from others were roughly three times more likely to die during the nine-year study than people with strong social ties.” The Harvard Women’s Health Watch also reported that peoplewith satisfying relationships with their family and friends lived with fewer health problems. A lack of face to face communication triggers feelings of loneliness and can often develop into depression. If you haven’t been given social tools from a young age, creating meaningful and lasting relationships will be endlessly challenging. The most fascinating thing about the video game industry may be their lack of accountability. Type “school shootings linked with video games” into Google and the first post that appears bears the headlineBreaking down the debate over violent video games and school shootings. It’s an ABC article claiming there is no evidence to support the fact that young killers have been playing video games or the potential impact on their actions. It is a tricky debate because as stated in a Time article it is in part blaming a much more complicated issue solely on video games, but it’s hard to know their weight as ‘ethical standards prevent researchers from carrying out experiments that would directly showcase the relationship between video games and violence.’ Violence is not all the fault of video games, but behaviors that lead to violent acts are often connected to the detrimental effects video games have on young people. The Sandy Hook shooting, in December 2012, was carried out by Adam Peter Lanza, just 20 years old at the time. He held the highest score on a video game named School Shooting. Yes, that is what the game is really called and yes, I also wish that were a joke. His history of mental illnessincludes all of the symptoms children who are exposed to violent video games have developed. This is including, schizophrenic behavior, sensory integration dysfunction, and obsessive-compulsive behavior. This isn’t to say that every child who plays a violent game will end up committing a crime, but the disassociation that these violent games cause creates a void of empathy and a slew of mental health issues. Developmentally gaming affects the external world and the realms of reality and augments it. There has been controversy around whether or not violent video games are increasing gun violence. President Trump made a statementafter the Sandy Hook shooting that video games were causing the killings. This was responded to with rage, but mostly because of Trump’s loose views on gun control. He was not acknowledging the more pressing issue of the fact that a 20-year-old owned a gun in the first place. Gun control should be at the forefront of the discussion when it comes to school shootings and young people carrying firearms, but the mental decay that is being caused by screen time and the existence of games that allow young people to carry out virtual school shootings shouldn’t be completely dismissed. Digital addiction among children can be avoided and that really becomes the responsibility of parents. It is your decision as a parent whether or not to put technology into the hands of your child and your job to monitor it. The really important thing is the balance. Technology is an inevitable part of our lives and is increasingly incorporated in the way we teach, learn, work, and play. It may be unrealistic to completely cut it out of your child’s life but certainly creating healthy boundaries and monitoring the hours spent with technology will aid in avoiding the issues that come along with digital addiction.